Best known for introducing its affordable valve-based iPod docks to the world, Fatman has upped the ante and launched a three-box, no-compromise valve amplification system called the Mothership. 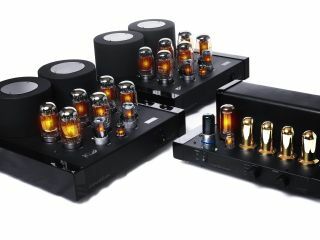 Distinctly high-end in nature and boasting an incredible 200 watts per channel, the preamp and twin monoblock configuration has made Fatman's "stereo fantasy a reality", according to a spokesperson. At the heart of the system is the iTube Controlroom preamp, which boasts six high-quality valves, "exceptional components" and a rigid chassis. The preamp is said to run in Class A operation. And although it has just three line inputs for connecting partnering equipment, it also has a dedicated phono input for turntables. Its partners in rhyme, also adding the muscle, are the iTube Engineroom monoblocks. They offer an unbelievable 200 watts of valve-based power - enough to drive any loudspeaker you throw at it. The massive power reserves are derived from an impressive bank of 18 perfectly matched tubes, which contribute to a colossal overall weight of 51kg (per Engineroom). The combined total hits the scales at 114kg, enough to make any Fatman sweat. The Mothership will be available in the UK and Europe from September 2007.